I couldn't see exactly what these folk were looking at in the water, but I imagine it must have been a frolicking seal, or perhaps a studious school of small fish. Last Sunday I spotted a small group of dolphins splashing about in the water outside of the V&A Waterfront, near the entrance to the Granger Bay harbour. A little while after I spotted a whale (perhaps a hundred meters further into the bay) splashing about, having a whale of a time (go figure, right?). After reading an article by David Hurwitz (who, last month, captured photos of orcas hunting dolphins in False Bay) it stuck me that it's possible that the whale I'd seen was in fact an orca (aka killer whale), and that the dolphins may not have had as much of a fun time as I'd previously imagined they were! 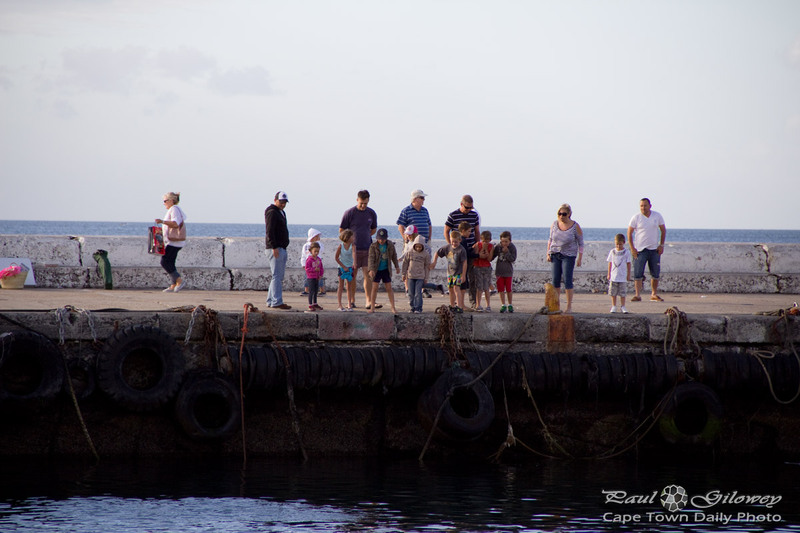 Posted in General and tagged harbour, kalk bay on Sunday, 10 June, 2012 by Paul.